Launched in 2006, easyfinancial is the Company’s financial services arm that provides installment loans to non-prime customers who have limited access to traditional bank financing products. easyfinancial’s product offering consists of unsecured and real estate secured installment loans as well it’s recently introduced secured savings loan, creditplus. The company also offers a suite of complementary ancillary products including a Loan Protection Plan, Home & Auto Benefits and Credit Monitoring. easyfinancial’s installment loans range in size from $500 to $35,000 at interest rates starting at 19.99%, with repayment terms of 9 to 60 months for unsecured loans and up to 10 years for secured loans. In the Company’s current portfolio, unsecured loans make up about 94% of loan originations, while secured loans make up the remaining 6%. Unlike revolving credit products that can trap customers in a cycle of debt, easyfinancial’s installment loans enable customers to progressively get out of debt by requiring them to make fixed payments including principal and interest, which results in the entire principal balance being repaid over the term of the loan. The Company believes that there is significant demand for non-prime lending in the Canadian marketplace and estimates that the size of the market excluding mortgages, is more than $186 billion. Historically, consumer demand for non-prime loans was satisfied by the consumer-lending arms of several large, international financial institutions. Since 2009, many of the largest branch-based participants in this market (including Wells Fargo, HSBC Finance and CitiFinancial) have either closed their operations or dramatically reduced their size over the past years due to changes in banking regulations related to risk adjusted capital requirements. Today, traditional financial institutions are generally unwilling or unable to offer credit solutions to consumers that are deemed to be a higher credit risk due to the consumer’s financial situation or less-than-perfect credit history. For this reason, demand in this market is met by a variety of industry participants who offer diverse products including auto lending, credit cards, installment loans, retail finance programs, small business lending and real estate secured lending. Generally, industry participants have tended to focus on a single product rather than providing consumers with a broad integrated suite of financial products and services. As a result, easyfinancial is one of a small number of coast-to-coast non-prime lenders with a history of success. The customer base that easyfinancial serves are everyday Canadians that are hard working and have often been met with life circumstances that have negatively affected their credit profile. These customers have an average age of 40, individual income of $44,000 per year, and a debt to disposable income ratio of about 95%, compared to the much higher Canadian average of 172%. These customers typically come to easyfinancial looking for a second chance as 60% of them have been turned down by a bank in the past, and are trying to improve their financial situation for themselves and their families. Through easyfinancial’s suite of lending products, the Company focuses on more then simply providing customers with the money they need today. easyfinancial’s customers are given the opportunity to graduate to larger loans and lower interest rates while they aim to rebuild their credit and be in a position to qualify for prime credit. Whether a customer is looking to establish, repair, build or strengthen their credit profile by borrowing funds or using the equity in their home to secure a larger loan at a lower rate, easyfinancial can provide a lending solution that best serves their individual circumstances. 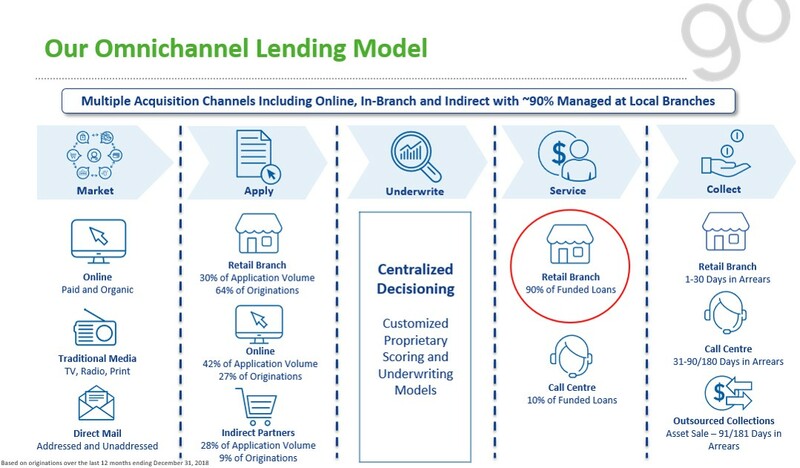 easyfinancial’s unique omni-channel model including its national branch network, remains a key differentiator in its non-prime lending business. Although the Company leverages multiple acquisition channels to attract new customers including online, in-branch and point-of-sale financing, 90% of loans are originated or managed at local branches. It is the Company’s experience that when lending into the non-prime market the omni-channel model optimizes loan performance and profitability, while providing high-touch and personalized customer experience. Customers that are originated and serviced by the personnel within the Company’s national branch network deliver greater lifetime value. The customer loyalty developed through these direct personal relationships extends the length of the customer relationship and improves the repayment of loans which ultimately leads to lower charge-offs. easyfinancial has also demonstrated a history of stable and consistent credit performance. 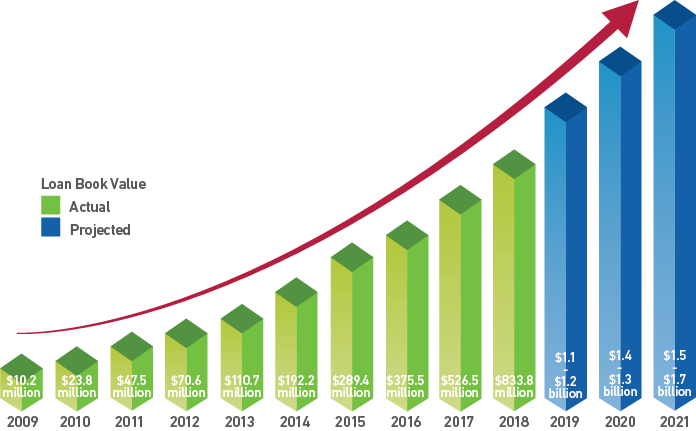 Since 2006, the Company has served over 367,000 customers and originated 793,000 unique loans for a total of $2.9 billion in originations. Lending decisions are made using proprietary custom scoring models built using machine learning and advanced analytical tools that optimize the balance between loan volume and credit losses. These models have been developed and refined over time by leveraging the accumulation of extensive customer application, demographic, borrowing, repayment and consumer banking data. These models improve the accuracy of predicting default risk for the non-prime customer when compared to a traditional credit score. Credit risk is further enhanced by industry-leading underwriting practices that include pre-qualification, credit adjudication, affordability calculations, centralized loan verification, and repayment by the customer via electronic pre-authorized debit directly from the customer’s bank account on the day they receive their regularly schedule income. With the easyfinancial’s National branch network, unique ability to deliver on our customer promise, market experience in originating over $2.9 Billion in loans, and healthy balance sheet, the Company is well positioned to continue its history of success as it delivers against its ambitious growth targets. With our National branch network, market experience in originating over $2 Billion in loans, robust infrastructure and healthy balance sheet that includes our recent closing of a US $325 million high yield debt offering and $110 million bank revolver, we are well positioned to deliver our strongest level of growth to date.